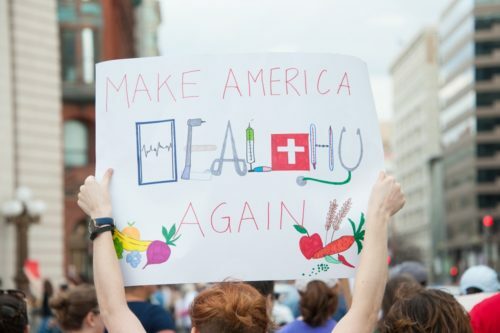 Six members of the Presidential Advisory Council on HIV/AIDS (PACHA) resigned this week in protest of Donald Trump’s apathy towards the epidemic and his attempts to take health care access away from people living with HIV/AIDS. The PACHA was created in 1995 during the Clinton Administration to provide recommendations about the government’s response to the HIV epidemic. The Bush Administration continued the council’s charter and during the Obama Administration the council created and monitored the National HIV/AIDS Strategy. Schoettes cites several incidents that showed that Trump doesn’t care about HIV/AIDS policy, including his refusal to meet with HIV advocates during his campaign, the removal of the Office of National AIDS Policy’s website when he took office, or his continued failure to appoint someone to head the White House Office of National AIDS Policy. But most of all Schoettes is concerned about Trump’s attempts to take health care access away from the poor and the working class by repealing the Affordable Care Act (ACA). Before the ACA, many people with HIV couldn’t even buy health care (forget about affording it) because HIV is a pre-existing condition. Medicaid was difficult to access because a person had to have AIDS to be considered disabled and get coverage. Schoettes writes that he hopes members of Congress will consult the PACHA while working on health care legislation. While there is an argument for do-gooders to take on or keep their jobs during the Trump Administration, this set of resignations makes sense. The PACHA provides recommendations; if no one cares about those recommendations, then they aren’t doing anything other than to provide window-dressing.